Kletzenbrot has long been part of Christmas celebrations in the Tyrolean Alps. Kletzen are the intensely sweet, dried pears that were stored by farmers' wives to use through the winter. 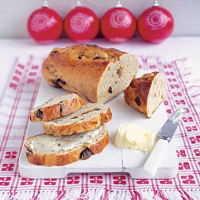 This is a lighter, more modern version of the bread, using dried pears and other dried fruit. Bake it on Christmas Eve, or better still (if you are an early bird), leave it to rise overnight in the fridge, then let it come back to room temperature and bake on Christmas morning for breakfast. Roughly chop the larger pieces of fruit. Place all the dried fruit in a bowl with the rum, stir and set aside for at least 2 hours, stirring occasionally, until plumped up. Mix the flours with the yeast, caster sugar, salt, spices and lemon zest. Make a well in the centre and add 2 eggs, the butter and about two thirds of the milk. Mix to a soft dough, adding more milk as needed. Knead vigorously for 5–10 minutes until smooth and elastic. Cover the bowl with clingfilm and leave in a warm place for 1–2 hours until doubled in size. Preheat the oven to 200°C, gas mark 6. Turn out the dough onto a lightly floured work surface. Gradually knead in the soaked fruit, dusting the dough occasionally with flour if it becomes sticky. Divide the mixture in two. Shape each piece into a long, oval loaf. Press three almonds into each one, evenly spaced out along the top. Place on floured baking trays, cover each one loosely with clingfilm and leave in a warm place for about 30 minutes until doubled in size. Mix the egg yolk with 1 tbsp water. Brush the loaves lightly with the egg wash, then bake for 20–25 minutes. Check after 15 minutes and lay a sheet of foil over each loaf if they are browning too much. When done, tap the underneath of each loaf – if it sounds hollow then it is cookedthrough. If not, return for another 5 minutes. Leave to cool on a wire rack.